On JUNE 08, 2011. 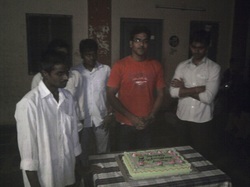 We celebrated our beloved member Mr. SRAVAN KUMAR's birthday in that hostel along with 15 physically challenged persons. On that occasion, He helped and funded a STAND for the WATER TANK for the children there. It was really a WARM feeling being with them.